Update: The NHF loan program is no longer available as of Feb 29th, 2016. However, there are a few other grant programs available in Colorado, please call Sean at 303-521-7169 or email sean.young@nafinc.com for more information. Below is the 2015 NHF Platinum 5% Grant Colorado Income Limits per county. * With NHF the income limit does not change based on family size. * With NHF they only count the borrowers income, not household income. Click here for the NHF Platinum Income Limits for every participating State. Want to know more about the NHF Platinum 5% Grant, click here or call Sean Young at 303-521-7169. If you would like to get pre-qualified for this program click below. National Homebuyers Fund, Inc. (NHF) is a non‐profit public benefit corporation and Instrumentality of Government under Internal Revenue Service code section 115. 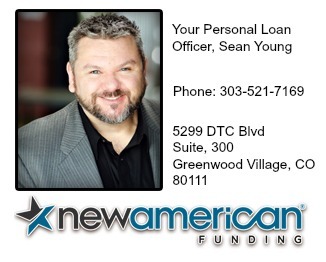 MyLenderSean.com is not a lender and is only the domain name for loan officer Sean Young (NMLS 191647 / LMB 100013240) who is an employee of Broker Solutions, Inc. DBA New American Funding (NMLS 6606). However, there are other grant programs available in Colorado, please call Sean at 303-521-7169 or email sean.young@nafinc.com for more information. Would you buy a home today if did not have to worry about the down payment? Then this program may be exactly what you have been waiting for. What is the NHF Five Percent Grant Program? 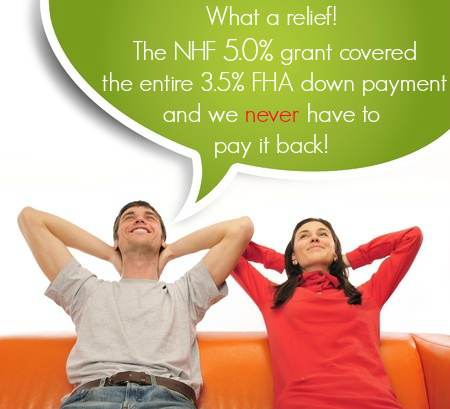 The NHF Platinum Five Percent grant is a down payment assistance program that actually gives you up to a 5% grant to go towards your FHA 3.50% down payment and closing costs. This is a grant you don’t ever pay back. Yes, you heard me right. You never pay it back! **Note** program changes as of 12/01/2015. NHF only allows up to a 5% grant if your middle credit score is 660 +. If your score is 640 to 659 you are now limited to a 4% grant. The Five Percent grant is a percentage of the total loan amount. See below for an example of a $200,000 purchase price with an FHA loan. FHA requires a minimum down payment of 3.5% and adds 1.75% for the FHA Up Front Mortgage Insurance Premium on top of the base loan amount. WOW! You never have to pay this back! In this scenario you would have enough to pay the $7,000 down payment and have $2,218.85 left over to apply towards your closing costs. 1: Have a minimum middle credit score of 640-659 to get up to a 4% grant. Have a minimum middle credit score of 660+ to get up to a 5% grant. Call 303-521-7169 to get started or click here to fill out an online application. Why do they give you a five percent grant? Five percent grant that I don’t have to payback, what’s the catch? 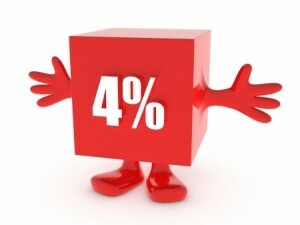 Catch #2: The closing costs are higher by a 1.50% origination charge, this is 1.50% of your loan amount. Plus a funding fee of $400 to US Bank. No, this program is available to the entire State of Colorado. No, manufactured homes are no longer allowed on this program as of 12/01/2015. Is the max county income limit for the borrower only or the entire Household? Unlike other down payment assistance programs, the NHF only counts the borrowers income towards the max county income limit. The income limit does not change based on family size. Do I have to attend a homebuyer education class? No, you don’t. This program does not require it. However, you can always choose to attend one if you like. There are many great places you can take this class for Free. Below are a few, you can visit the below links or I can help you schedule a class. You can also do an online class at eHomeAmerica for a $99 charge. If you get a code they will give you a slight discount for the 2nd person if needed. 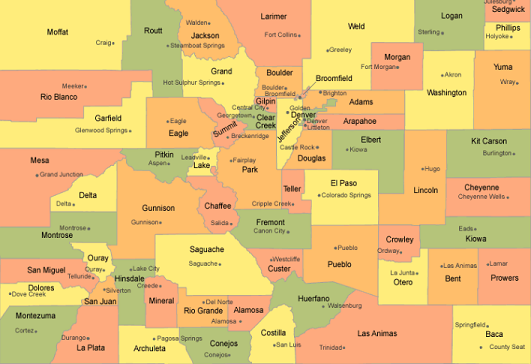 Click here for a list of all HUD approved housing counseling agencies in Colorado. Always make sure to show up on time and to keep a copy of your certificate. No you cannot get approved with a Refer Eligible through Desktop Underwriting and/or get approved with manual underwriting. You have to receive an Approve/Eligible from DU or Accept from LP. The closing costs are slightly higher with this program as we have to charge an additional 1.5% origination that is not normally charged on other FHA or VA loans, plus a funding fee of $400 to US Bank . The good news is that after your 3.5% down payment has been taken out you will have some grant funds left over that you can apply towards your closing costs. Yes, you can get your earnest money back at closing as long as the 5% grant and any other credits, like seller paid closing costs cover the down payment and remaining closing costs. Yes you can, but to qualify for a Mortgage Credit Certificate (MCC) you have to be a first-time homebuyer or buy a home in a targeted area. A first time homebuyer is defined as someone who has not owned a home in the past three years. With an MCC you will receive an annual federal income tax credit up to 20% of the annual interest you pay on your mortgage loan. Call me for more details and to see if you qualify. 303-521-7169. Funds are not always available, so you will need to check if they are. 2: Or, call Sean Young at 303-521-7169 to answer any additional questions and/or to do an application over the phone. you never have to pay back. 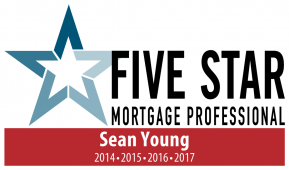 Sean was amazing in helping us with our home loan!! 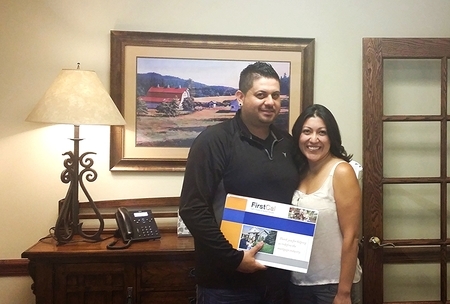 We were first-time homebuyers and Sean was very understanding and knowledgeable!!! He would get back to us quickly with any questions or concerns we had!! I highly recommend him!!! The Ortiz Family.